I don't have in my possesion many pictures of me as a youngster, but a family friend sent this to me awhile back so I thought I would post it for you. I believe this is out at Little Bow campground. 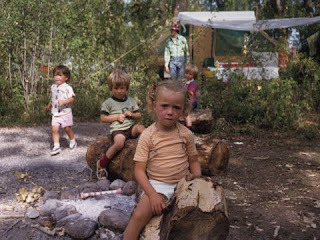 I have great memories of riding my bike around and around and around that campground- although you'd never know it by the expression on my face in this picture. That is our trusty tent trailer in the back ground, Carey is on the log behind me and my sister Christie running. Don't you just love my dad's ensemble and I don't remember him ever wearing that hat, but I guess he did. Camping is the best! We look forward to doing some more of it now that we live here. Do you like camping? I loved camping as a kid. Ben and I went last year and we decided that it's fun but we might not do it very much. Especially with little ones. I guess the fact that we weren't prepared for the cold and we froze our buns off didn't help. The kids were also freezing so they didn't sleep which meant that Ben and I didn't sleep either. We drove 5 hours to camp for one night. Needless to say we didn't have a very good time camping for the first time with our kids. It's been a year so I'm willing to give it another try. Maybe we just need a trusty camper like your in the picture. You and brad need to show us the ropes! By the way...if Ethan had pig tails a few years ago, that is exactly what he would have looked like. LOL! You're the cutest kid Tracey! NEVER camp for one night! No fun! We also learned this the hard way. You spend more time setting up and taking down than being there PLUS you travelled 5 hours!!?? Give it another try... I bet you'll like it better :D Come on out we are set up with our Taj Mahal tent, plus a little 4 man tent too. We've got tonnes of air mattresses from when we camped out in our house before our furniture got here. We'll be waiting!! I am so glad that my kids are old enough now that we can camp for a while, I look forward to it this summer as well. Good times eh? That little girl running is SO cute, someone should have taken a closer picture of her. oh my goodness, you are SO cute and so super tan!!!! I love that picture of you. and yes we like camping, in an RV ha ha ha. I didn't know you were a blondie when you were little. And no, I don't like camping!! Actually, I haven't done it enough to really know. Jeromy really wants to do it, but we don't have any equipment, and I'm afraid of wild animals! And kids running off and getting lost. If I could have a 100% guarantee of our safety, I might be tempted to give it a try. Wow, what a tan! We camp a lot too and your story about your bike reminds me of Wade. He always rides in a million circles around camp.